Today I’m going to show you how we boosted our organic traffic by 43% over a 3 month period. The best part is, we did it without publishing any new content, spending any more money on marketing or adding any additional resources to our team. We call the strategy, The Mission Week, and I will tell you exactly how we do it. I am the founder of small business-focused job board called Proven. In October of 2015, we made the difficult decision to completely forgo building a sales team and focus all our efforts instead on acquiring customers via content marketing and SEO. We knew that given the price point of our product, it was not economically viable for us to have people make sales calls. We needed a lower cost solution to bringing in new customers. This led us to seeking a content marketing and SEO strategy. Like many companies new to blogging, we rushed into it full steam, cranking out tons of new posts. We started to realize that this was a doomed strategy. We had hundreds of posts, but were barely moving the needle on our overall traffic. We figured we could only get a traffic boost as long as we were creating new content. In early 2016, we started to learn a lot more about content promotion and link building. This led to a number of content successes, like ranking in the top 5 on Google for the search term"job board", but after a while, this growth started to tail off. Our content promotion was unfocused, lacked clear goals, and as a result, great pieces of content were not ranking well. Finally, this all changed when our amazing Director of Marketing, Caileen Kehayas, invented The Mission Week. Our Mission Weeks consist of choosing one piece of content that’s under performing and everyone on the team focuses their promotional efforts only on this piece of content. We gamify the process by assigning points to different types of promotional activities. For example, sending an outreach email might get you 1 point, you can earn 2 points for broken link building and 5 points for writing a guest blog that links to the article. Each person must accumulate 20 points to complete their mission for the week. Regardless of your role in our company, you can participate. If you aren't comfortable writing articles, you can earn points through outreach emails, discovering linking opportunities or responding to relevant questions on Quora. As part of the promotion, we will do minor content updates and perhaps update the title and meta tags of the article. The weekly point goal is small enough that it doesn’t take up so much time that it becomes overwhelming. Team members can easily earn enough points without compromising their regular workloads. Involving everyone at Proven -- even those outside of the marketing team -- helps create more dynamic and diverse supporting content. We all have different backgrounds and skill sets, and everyone is focused on promoting the same piece of content. With everyone participating, it’s a great opportunity for team building across different departments. In January 2016 we published an article called How to Interview: The Definitive Guide. After being live for 10 months on our blog, it never cracked the top 10 for Google search results for any high value set of keywords. We chose this article back in late October as our first Mission Week. This article now ranks 5th on Google for “how to interview”, and has 49 backlinks from 27 domains. Each participant was awarded 1 point for an outreach email sent to a site that was linking to similar content. Primarily, we use a resource link building strategy that I wrote about previously. During this week, each person on the team sent an average of 18.5 outreach emails to sites linking to similar content. To research 15 to 20 different possible sites and send them an email doesn’t take up too much of a person’s week. However, if someone was left doing all this outreach on their own, it becomes a huge tedious job that eats up a large portion of their week. Each participant was awarded 5 points for writing an article that contained a link to this blog post. During this week, our team produced 7 related articles that our Director of Marketing helped publish to different sites. Again, writing one support piece is not too bad, but writing 7 is completely unreasonable for our small team. 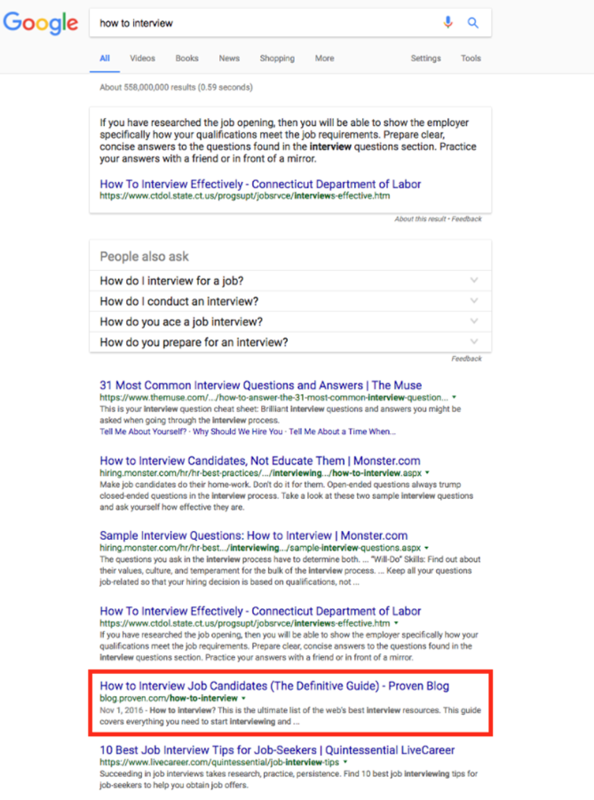 We updated the title of the article to How to Interview Job Candidates (The Definitive Guide), because adding brackets to your title can help increase CTR on Google. We also updated the introduction and gave the design of the page a bit of a face lift. All of these things help to improve CTR, bounce rate and dwell time, which are all ranking factors for Google. As part of the mission, we schedule promotion of the article on Twitter, LinkedIn, Facebook and Google+. We typically schedule up to 8 tweets for a single article, changing up the text and hashtags we use. If one tweet is performing really well, we will re-use it again and again on different days and different times. Each participant was awarded 2 points for finding and answering a relevant Quora question. Although these are no-follow links, it does help to create brand awareness, referral traffic, and authority in the industry. During the week, we had one team member answer 5 questions on Quora. As mentioned, this article now ranks 5th on Google and went from delivering close to zero organic traffic to now being one of our top performing pieces. We’ve seen consistent movement in our Google rankings for every subject of a Mission Week thus far. Following the same process outlined above, we did a Mission Week for this article about job ads. We now rank 2nd on Google for ”job advertisements” ahead of industry giants like Indeed and CareerBuilder. Each week, our marketing director chooses the article with the most SEO potential that is under performing. Separately, we track in a shared spreadsheet all the outreach emails we send so that we don’t accidentally email the same person. This is also good for historical reference because it’s sometimes worth revisiting and following up with any outreach emails that get sent. Mission Weeks have completely transformed the way we actively promote our content. Prior to having the Mission Weeks, we used a lot of the same promotional strategies, but it was not focused and many team members didn’t have clearly defined weekly goals to work towards. Now, every week, everyone knows exactly what they need to accomplish. Marketing, engineering, customer support and the executives of Proven all participate, driving towards the same goal of accumulating 20 points. We brag to one another over Slack when we complete our missions or land a new link, which is typically followed by a barrage of GIFs. Not only has The Mission Week process grown our organic traffic, it's increased our new customers significantly in a short period of time. I strongly encourage you to give it a try. You can play with the point system and weekly goal based on the needs and resources of your company. Would you consider running a Mission Week at your company? Share your thoughts in the comments.